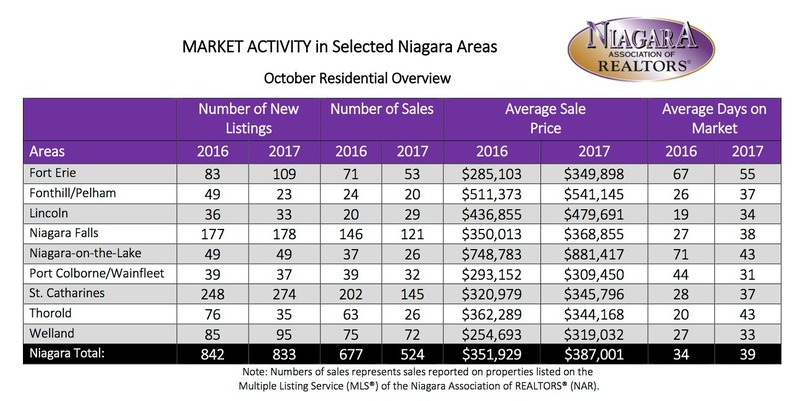 The Niagara Association of REALTORS® (NAR) reported 577 property sales processed through the NAR Multiple Listing Service (MLS®) system in October. This represents a 23.17% decrease in sales across Niagara compared to October of last year. In Pelham and Welland, unit sales for the month were down 16.7% and 4% respectively. The decline in sales for the month is reflective of the Niagara market transitioning into a more balanced position from the peak sales activity that occurred during the past year. It's been quite a ride for the past year in our local marketplace with Pelham's 12-Month Average Price up 20.9% while Welland jumped 29.4%. With unit sales on the decline prices are beginning to stabilize. We'll be keeping a close watch on these 12-Month Average figures to keep a pulse check on how prices are holding in the Market. During October the average days on market increased from 34 to 39 in the residential freehold market and decreased from 51 to 46 in the condominium market. “New mortgage guidelines are on the horizon and the impact, if any, of those new guidelines remains unknown,” said Carolyn Bones-Poley, CEO, Niagara Association of REALTORS®. “Buyers and sellers considering a move should contact a REALTOR® to discuss the new mortgage guidelines and how they may impact your real estate purchase,” said Bones-Poley.